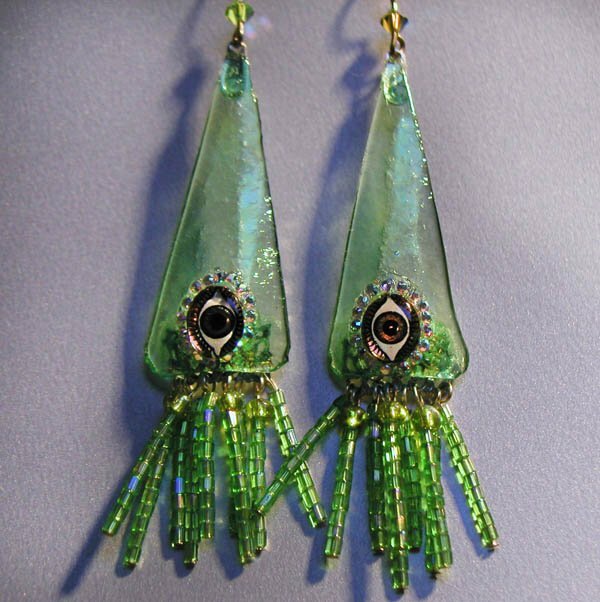 Iridescent translucent Spring Green 3 1/2 inch long slumped glass SQUID earrings. They sparkle with vintage changeable golden/green glass eyes, and tiny aurora borealis Austrian crystals. They are 3/4 inch wide, light and comfortable to wear. The tentacles have iridescent spring green bugle beads, and the wires have faceted light green aurora borealis Austrian crystals. These earrings are stunning and unique, elegant and audacious. Here are shiny Opaque Lavender 2 1/2 inch long slumped glass SQUID earrings. 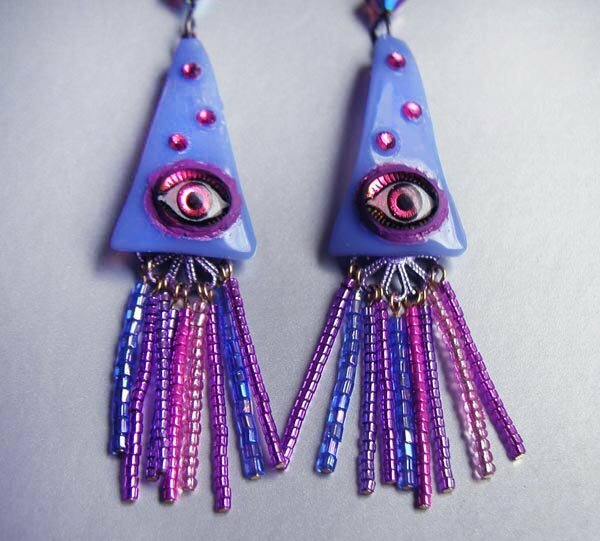 They sparkle with vintage changeable red/green glass eyes, and magenta Austrian crystals. They are 5/8 inch wide, light and comfortable to wear. The tentacles have lavender, blue, magenta and purple seed beads, and the wires have faceted lavender/magenta aurora borealis Austrian crystals. 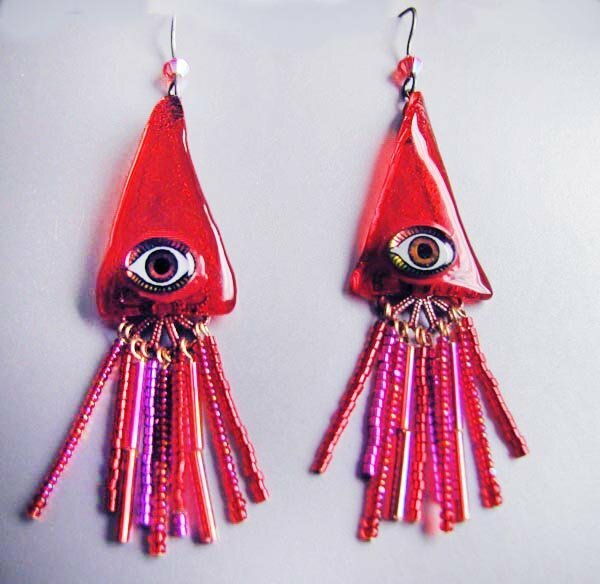 These transparent squids are a bright, happy orange, adorned with vintage red/green glowing eyeballs. They are 2 1/2 inches long, and 5/8 inch wide. The tentacles are a mixture of red, orange, magenta, and lavender bugle and shiny seed beads. 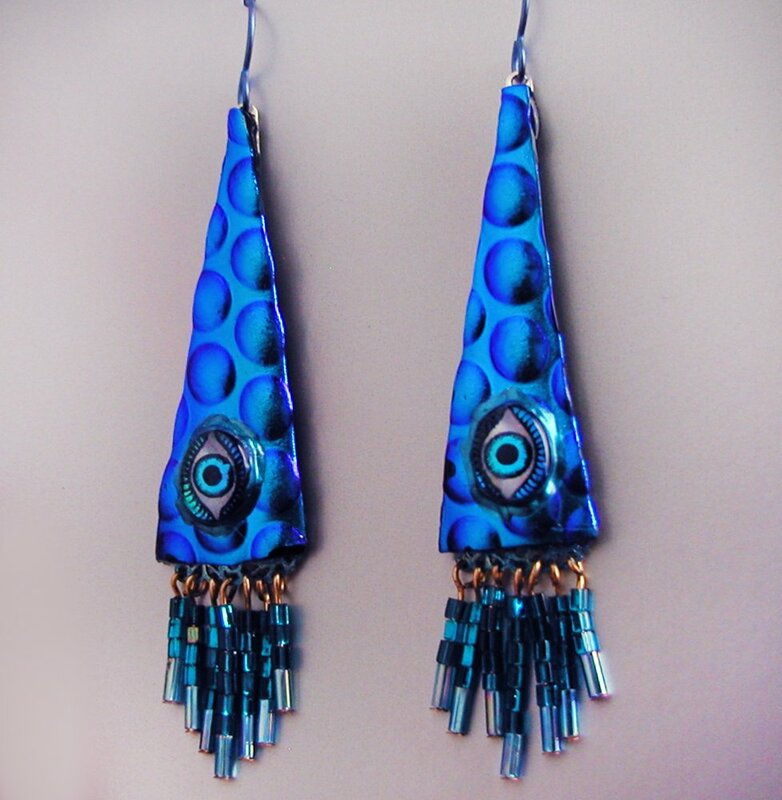 These are sparkly Iridescent Royal Blue 2 1/2 inch long slumped glass SQUID earrings that are adorned with vintage changeable turquoise/blue glass eyes. They are 5/8 inch wide, light and comfortable to wear. The tentacles have blue and teal seed beads, and the wires have faceted teal blue Austrian crystals. Bumpy and spotted purple and dark orange iridescent glass squids most resemble real squids in a passionate moment! 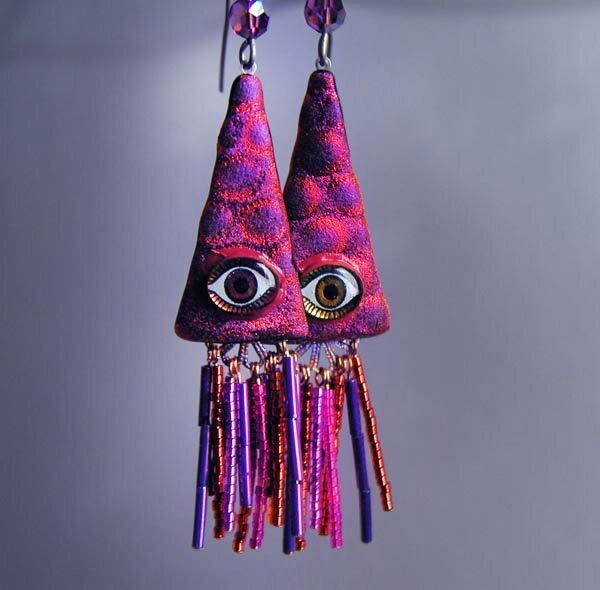 Adorned with vintage iridescent olive/amber eyes, and orange , pink and purple tentacles, these squids are a unique and fabulous addition to the collection. 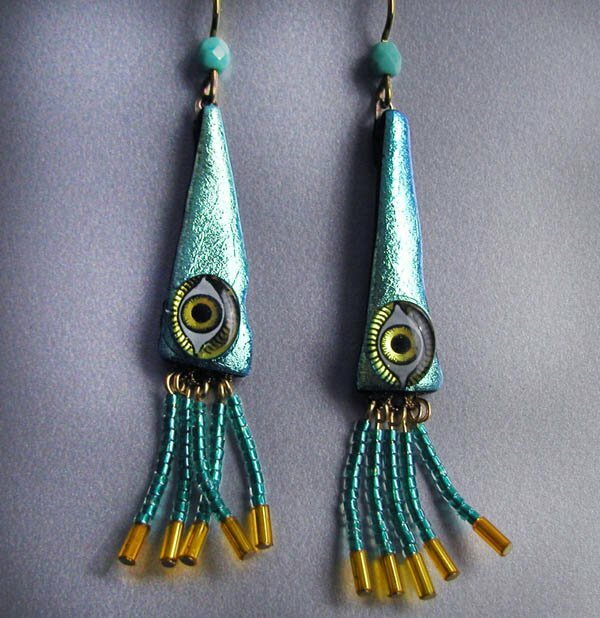 These slender squids are an iridescent turquoise blue, adorned with vintage amber/olive glowing eyeballs. They are 2 1/2 inches long, and 3/8 inch wide. The tentacles are turquoise blue shiny seed beads tipped with yellow bugle beads. 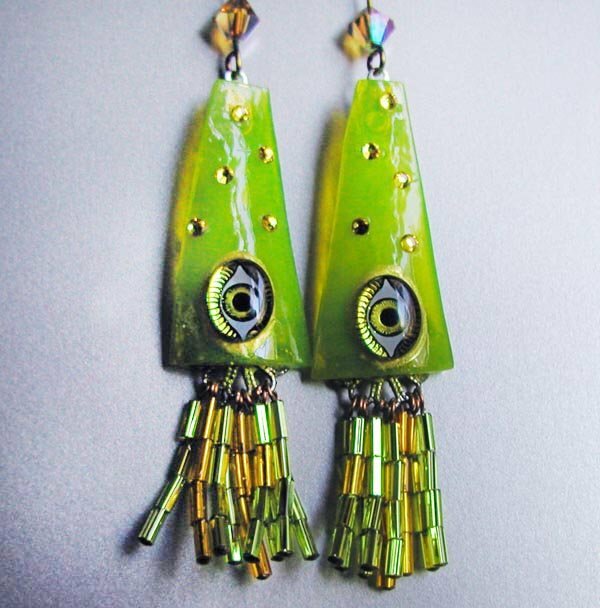 Shiny translucent LIME GREEN 3 inch long slumped glass SQUID earrings. They sparkle with vintage changeable golden/green glass eyes, and golden Austrian crystals. They are 5/8 inch wide, light and comfortable to wear. The tentacles have golden and lime green bugle beads, and the wires have faceted golden aurora borealis Austrian crystals. They have great movement, the colors of chartreuse and gold are really fun! 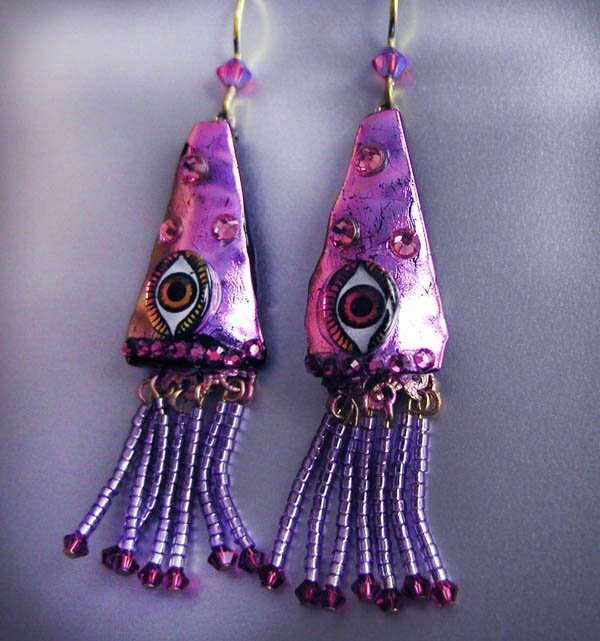 These are shiny Iridescent Magenta 2 1/2 inch long slumped glass SQUID earrings that are adorned with vintage changeable pink/green glass eyes, and sparkly rose Austrian crystals. They are 1/2 inch wide, light and comfortable to wear. The tentacles have lavender seed beads, and also magenta Swarovski bicone magenta crystal on the ends. The wires have faceted magenta Swarovski crystals as well.